YEREVAN—Armenia’s Public Service Regulatory Commission unanimously approved a 10 percent rate hike in residential electricity bills effective August 1, despite protests that often turned violent in weeks leading up to the decision. Tuesday’s decision of almost a 10 percent hike in electricity prices for households will allow the Electrical Networks of Armenia, the distributing company, to charge 41.85 drams per 1 kWh of electricity during daylight hours (from 7 a.m. to 11 p.m.), up from the current 38 drams, and 31.5 drams for night hours (from 11 p.m. to 7 a.m.), up from the current 28 drams. Garegin Baghramyan, the head of a PSRC department in charge of price policies, said the regulator allowed the Metsamor nuclear power plant to sell its electricity at 5.726 drams per 1 kWh, the Hrazdan thermal power plant will sell it at 36.925 drams, the Yerevan thermal power plant will sell it at 18.133 drams, the Vorotan Cascade of hydropower plants will sell electricity at 7.978 drams per 1 kWh, the fifth unit of the Hrazdan TPP, owned by Gazprom Armenia will sell it at 40.08 drams per 1 kWh. Baghramyan added that the tariff for electricity transmission by the High Voltage Networks company is set at 1.6373 drams for 1 kWh. He also said that the price hike is meant to ensure the financial stability of power companies and safe energy supplies. In this regard, he noted the need for a major rehabilitation of the Yerevan TPP, also the repayment of loans attracted by the facility and to secure independent water supply to the nuclear power plant because of upgraded safety requirements. The PSRC claimed that without the rate hike Armenia’s power generating and supplying companies would lose 1.5 billion drams. Concerned citizens and activists gathered at Saryan Street, the site of the PSRC hearing, on Tuesday to continue voicing their opposition to the rate hike, which they deem would fuel a rise in the price of other goods and services. The protests turned violent last week when police used force to disperse the peaceful demonstrators and arrested some, who they claimed were breaching the law. 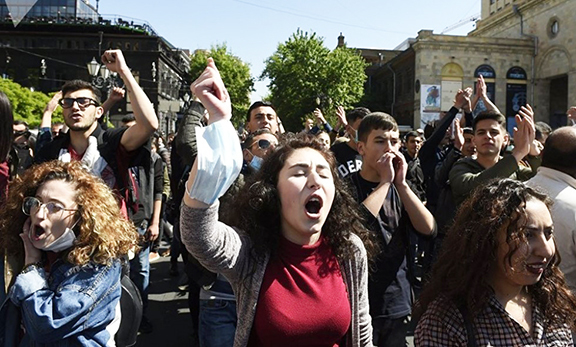 The sight of police brutality against demonstrators demanding social and economic justice unfortunately has become commonplace in Armenia and the government’s inability to take citizens’ concern into account when making decisions that impact their daily lives continues at full speed. It is a grim reminder of President Serzh Sarkisian’s remarks earlier this year that even if 80 percent of the country’s citizens are opposed to something the government will plow ahead with its plans. That reference was used to mass protests against the proposed pension reforms, parts of which were deemed unconstitutional by Armenia’s Constitutional Court. Power rate hikes and other adjustments to services are nothing new to us, living outside of Armenia. There were protests last year in the City of Glendale when the City Council voted to hike electricity rates and similarly last month there were protests at the MTA for its proposed bus and metro fare hikes, which are scheduled to take effect in September. However, none of those protests turned violent and no arrests were made by local law enforcement. The said hikes to impact the bottom line of customers here, but in Armenia with unemployment at all time high and the median income at an all-time low, citizens’ concerns about hikes of any kind impacting their every-day bottom line is valid and their concerns must be heard. Although Prime Minister Hovik Abrahamian on Tuesday instructed the relevant ministries to seek measures to absorb some of the costs for low-income households, usually rate hikes are proposed with such social service plans in place to alleviate the burden of customers. The US economy is in shambles because of subsidies, welfare, SSI, Secrion 8. Programs including EBT and this ridiculous pensions for gov employees. This mentality in Armenia that its their god given right to have their life subsidies by the government needs to change. Work hard and save your money for your retirement. Talk to any Armenian from Armenia they all laugh and comment that no one paid for the electricity, phone, water. They all filled the pockets of the officials who would read those meters or that they would steal the electricity off the main line. It’s high time they start paying for services just like the rest of humanity. Well said HH, well said indeed. Of course it would not be Asbarez if sensationalist garbage like this was not written over a very normal 10% fee hike, the likes of which are seen in every nation in the world on a daily basis. The rationale for the hike seems very reasonable especially when safety is taken into consideration. Seems Armenians in Armenia and the Diaspora think plutonium cooling systems from 1980’s should last forever and a power plant needs not maintenance or upgrading over a 25 year span.